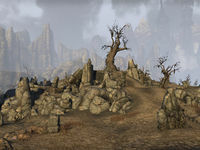 Sanguine Barrows is a graveyard in southeastern Rivenspire, southeast of Hoarfrost Downs. Sanguine Barrows Objective: Bring King Ranser's spymaster to justice for atrocities. Crimes of the Past: Help bring a war criminal to justice. Time in Doomcrag's Shadow : Seal the many time breaches that have opened throughout the twisted lands of Rivenspire. 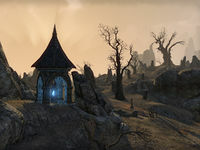 Sanguine Barrows Wayshrine is located across the road south of the graveyard, near the entrance to the Crypt of Hearts. Sanguine Barrows re-appears in Legends, in the Return to Clockwork City storyline. This page was last modified on 19 November 2018, at 05:38.